The Johannesburg High Court has ruled that citizens and communities have the constitutional right to be informed about and comment on alcohol policy issues that affect them. “This is an important victory for public health interests”, comment SAAPA and the Yeoville Bellevue Ratepayers Association. The conflict around licensing regulations in Gauteng, one of the nine provinces of South Africa, has been going on for many years. Liquor outlets in Gauteng have been operating under Shebeen Permits from 2004. In 2013 a new set of regulations, Gauteng Shebeen License Regulations, were introduced to replace the old ones. The new 2013 regulations were challenged by public health interests under the leadership of Maurice Smithers and Yeoville Bellevue Ratepayers Association (YBRA) because the requirement to announce new licenses had been taken out. This meant that the citizens’ and communities’ possibility to comment on new licenses was reduced. The conflict has now been resolved by a ruling in the Johannesburg High Court saying that the 2013 regulations are in direct conflict with the stated purpose of the Gauteng Liquor Act of 2003 and are therefore invalid. “The ruling is a victory for democracy and for the right of ordinary community members to have a say in the development and implementation of alcohol policy, especially in situations where they are directly affected, i.e. in their own neighbourhoods”, comment YBRA and the Southern African Alcohol Policy Alliance (SAAPA). South Africa has an estimated number of 220.000 liquor outlets in a population of around 56 million people. Two thirds of these outlets are unlicensed. South Africa is known to have a situation with high levels of alcohol consumption, a high proportion of drinkers with a risky drinking pattern and high numbers of alcohol-related problems. In terms of FASD prevalence (Fetal Alcohol Spectrum Disorder) South Africa is sky high above any other country. 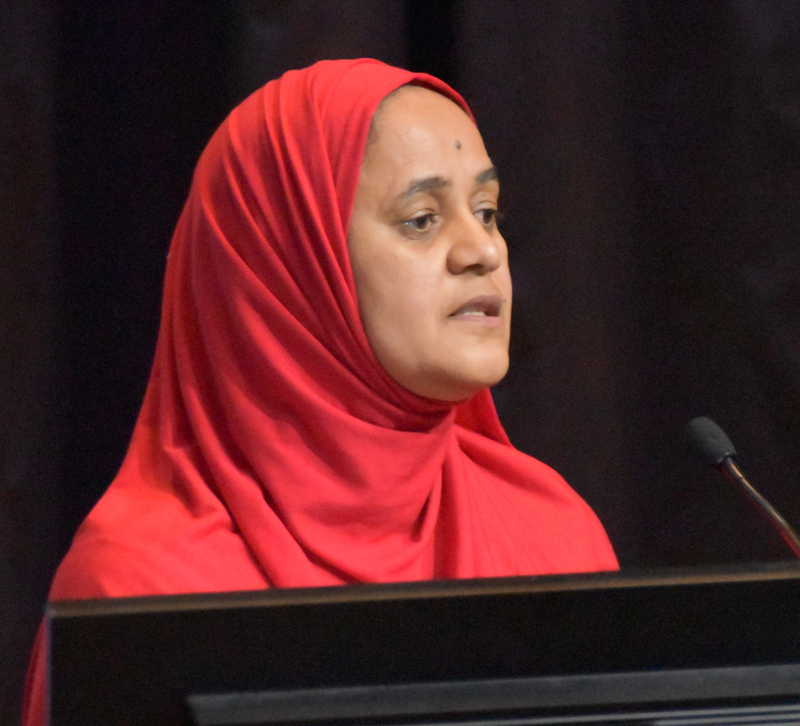 “Given the large number of alcohol outlets, many citizens, families and communities in South Africa are affected by drunken behavior to the extent that their welfare, safety and quality of life is severely reduced”, comments Aadielah Maker Diedericks (picture left, speaking at GAPC2017) on behalf of SAAPA. “Following the High Court ruling, liquor outlets now have to announce in advance that they intend to apply for a license. This means that communities around the outlet can voice their opinions before a license is granted”. SAAPA explains that the organisation gave its support to this campaign in Gauteng early on. “We believe in the right of ordinary people to have a voice in what is decided on matters which directly affect them”, says Aadielah Maker Diedericks. “We are a network of civil society organisations from eight countries in the region, and in all these countries our members are striving for a louder voice for public health interests in liquor-policy issues”. The Gauteng Liquor Act, as well as all other liquor acts in the country, require that an applicant for a liquor license is obliged to advertise their intentions by publishing the details in the Government Gazette, in two newspapers distributed in the area where the liquor outlet was to be established, and by posting a notice on the premises where the liquor outlet was to be established.